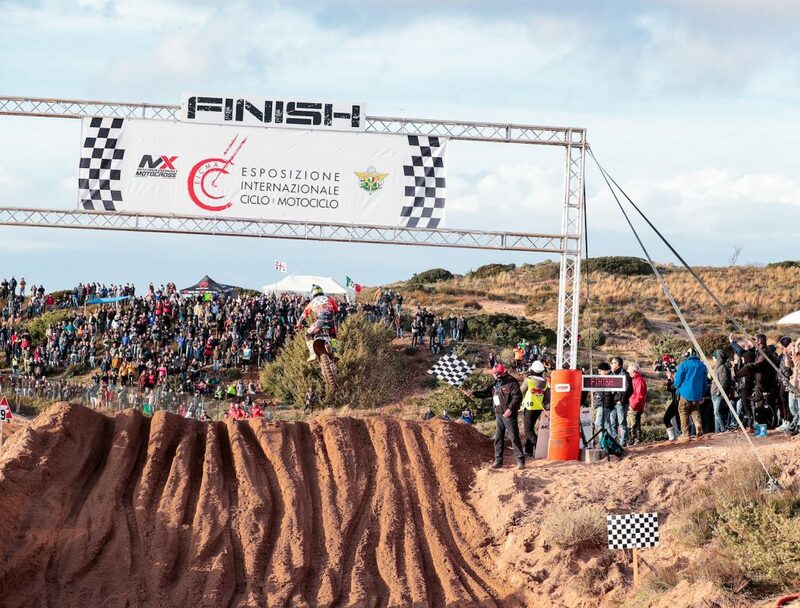 The first round of the Internazionali d’Italia EICMA Series at Riola Sardo has just ended a few days ago, on the tricky and sandy track the “Dune” of the Motoclub Motor School. The results of the first races confirmed the values ​​on the track and the show was not missed also by the over 175,000 spectators who were connected to www.offroadproracing.it to follow the live streaming of the four races broadcast, witnessing the double of the champion in charge of the MX1 and the Supercampione classes, Tony Cairoli (KTM Red Bull Factory Racing), who took home the victory in both classes, thus confirming to be the man to beat in this 2019. Also Romain Febvre (Monster Energy Yamaha Factory) and Tim Gajser (Honda HRC ) confirmed to be ready with their excellent performances and results in MX1. Great show also in MX2, where Mattia Guadagnini (Madii Racing), who conquered an incredible third place, after leading for six laps, will be called to confirm the placement behind the World Champion Jorge Prado (KTM Red Bull Factory Racing) first, and the young Danish talent, debutant riding the 250 team Rockstar Energy Husqvarna Factory, Mikkel Haarup. At Ottobiano on Sunday there will be all the top riders already aligned in Sardinia, joined by two names known as those of Max Nagl (TM) and Arnaud Tonus (Monster Energy Wilvo MXGP), bringing the number of subscribers to touch 242! The show on the track with the sandy bottom that guarantees the smooth running of the races even in case of any rainfall will be unforgettable and the atmosphere as always magical in what is becoming one of the Motocross World temples. In MX1, other than Cairoli, Gajser, Febvre and Paulin (Monster Energy Wilvo MXGP), there will also be Arminas Jasikonis (Rockstar Energy Husqvarna Factory), which confirmed its presence on the social networks after the crash reported in Sardinia, and the Italians Ivo Monticelli (KTM Standing Construct), Alessandro Lupino (Gebben Van Venrooy Kawasaki) and Samuele Bernardini (Yamaha Ghidinelli). A lot of waiting also for the official and supported riders Honda, Calvin Vlaanderen (Honda HRC), Mitchel Evans (Honda 114 Motorsport), Zachary Pichon (Honda 114 Motorsport) and Chichiro Notsuka (Honda 114 Motorsport), for those Yamaha, led by Ben Watson (Kemea Yamaha Racing), Jago Geerts (Kemea Yamaha Racing), Michele Cervellin (SM Action Yamaha), Maxime Renaux (SM Action Yamaha), Caleb Grothues (SDM Racing Yamaha). In 125 Andrea Bonacorsi (KTM Celestini Junior) will be called for the first time to defend the red table of leader of the class, won Sunday in Riola. The fifteen year old will find in Ottobiano an ideal soil to ride and be able to continue to compete on par with the best European riders of the class, among which the French Florient Miot (Yamaha MJC) and Bogdan Krajewski (KTM), that climbed on the Sardinian podium respectively on the second and third step. Appointment with the Internazionali d’Italia EICMA Series then for Sunday 3 February on the track of Ottobiano (PV) and for those who can not be there in person, live streaming from 1.40 pm on www.offroadproracing.it We will start with the MX2 class, followed by the MX1, the 125 and the final of the Supercampione class.